The University of Nottingham is developing an artificially-intelligent sensor system to clean food manufacturing equipment more precisely, which could save £100m a year for the UK industry alone. This revolutionary AI-driven monitoring system could lead to greater production capacity and therefore cheaper food prices for consumers. The University of Nottingham is developing an artificially-intelligent sensor system to clean food manufacturing equipment more precisely, which could save £100m a year for the UK industry alone. This revolutionary AI-driven monitoring system could lead to greater production capacity and therefore cheaper food prices for consumers. Food and drink production is the largest manufacturing sector in Britain and the highest industrial user of water at approximately 430 million litres a day. As current technologies cannot accurately determine exactly how dirty food and drink processing equipment is inside, cleaning can last up to five hours a day – to minimise food safety risks. Cleaning accounts for 30 per cent of energy and water use and leads to excessive productivity down time and over-use of chemicals, at huge cost to manufacturers and the environment. This research project, led by Martec of Whitwell Ltd, in collaboration with the University of Nottingham and Loughborough University, has secured Innovate UK funding to ensure the UK food industry substantially cut cleaning times and remains a global leader. Dr Nik Watson, assistant professor and chemical engineer specialising in food measurement systems is leading the University of Nottingham team. To overcome this issue, the research team will design and build a lab-scale experimental rig. This facility will reproduce common industrial cleaning problems in a typical food-processing plant, and test conditions using various foods. They will also assess the potential for an artificial intelligence inspection system to measure precisely how much food residue and microbial debris is left inside the rig. Researchers will test a combination of ultrasonic sensing and optical fluorescence imaging technologies in comparison with existing detection methods for the best results. Dr Watson is working alongside Dr Elliot Woolley from Loughborough University. The two University partners have scientific expertise and industrial application experience in ultrasonic and optical sensing technologies respectively. The team is led by Derbyshire-based industrial partner, Martec, which specialises in the design, installation and use of CIP and hygienic technologies in food and pharmaceutical manufacturing. The year-long feasibility study will go on to develop bespoke software to process the sensor data results and generate algorithms for an AI-based monitoring system. This self-predicting system will be able to autonomously optimise the cleaning process in plant equipment in real-time. This use of AI cognitive decision-making for a novel Self-Optimising-Clean-In-Place (SOCIP) system will be world-first. “Due to the technical complexity of sensor integration such a solution does not yet exist. The aim of the SOCIP project is to overcome these technical barriers and reduce cleaning time and resource use by approximately 20-40 per cent,” said Dr Watson. This technology could one day be retrofitted on to existing CIP systems or incorporated into new installations, increasing its market potential. Of almost 9,000 UK manufacturers identified by the Food and Drink Federation, 1,000 plants currently use some type of clean-in-place. Retrofitting those sites alone gives rise to a £50m market opportunity. Equally, major global food manufacturers could potentially replicate the SOCIP system worldwide offering further expansion opportunities. “The self-optimising approach is a transformative technology in line with industry trends to greater automation and control of manufacturing processes. The major productivity, cost and quality control benefits will become widely adopted since the technology is equally suitable for both new installations and upgrades of existing facilities,” explains Ian Sterritt, co-owner and Director of Martec. Once operational, SOCIP requires no expertise and uses off-the-shelf electronic components making it attractive to smaller users and significantly increasing the market for the technology. 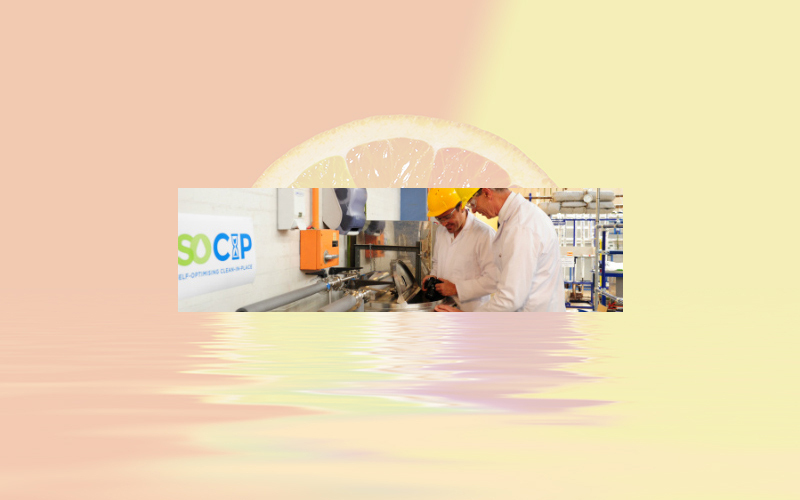 SOCIP would be a major cost-cutting technology for the food and drink industry with spin-out applications in other sectors such as pharmaceutical, FMCG and cosmetics. For a medium-sized dairy, cleaning typically costs £1m a year with loss of production time responsible for at least half of that cost. Using SOCIP on a dairy of this size is estimated to reduce annual water usage by 270,000 litres and energy consumption by 2,400 megawatt-hour, leading to net savings of £300,000 a year.